Rites Notification is out. Rites is recruiting for 02 Hindi Assistant Post Posts. You can check Rites - RITES last date, download Rites notification, visit Rites official website and check other Rites Vacancy details.Complete Vacancy and recruitment Details about 02 Hindi Assistant Post vacancies in Rites are provided below by JobSarkari.Com only for you. Last Date of Apply Offline. 18/07/2018. Last Date of Receipt Application. 26/07/2018. Hindi Assistant Candidate Must Have Passed Post Graduation Degree in Hindi With English As A Compulsory or Elective Subject At Degree Level. Candidate Having Post Graduation Degree in English With Hindi As a Compulsory or Elective Subject At Degree Level. Having Master Degree in Any subject Except Hindi or English With Hindi Medium And English. Having Master in Any Subject Other Than Hindi And English With English Medium As Mentioned in Notification. 01. 01. 02. For OBC Candidate. Max 33 Year. For SC Candidate. Max 35 Years. 3. Candidate Are Required to Fill All The Details. 4. Candidate Have to Take Print out of Completed Application Form. 5. Candidate Need to Apply Online Before 18th July 2018. 5. Candidate Need to Attach All the Compulsory Documents Like Age Proof, Address Proof, Education Certificate, Cast Certificate As Mentioned in Notification. 6. Candidate Need to Send the Application Form On Given Address on or Before 26th July 2018. 7. Assistant Manager, Rites Limited, Rites Bhawan, Plot No. 1, Sector 29 Gurgoan-122001. Q. What is the Last Date For Rites Hindi Assistant Post Vacancy ? A. 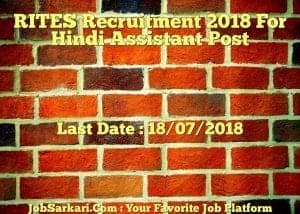 Last Date for Rites Hindi Assistant Post Posts is 18/07/2018. Q. 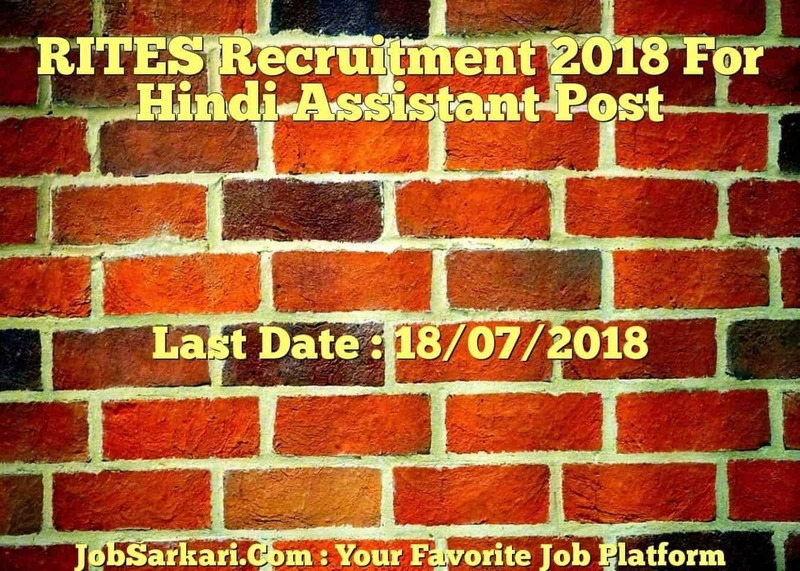 What is the Form Type of Rites Hindi Assistant Post Recruitment ? A. The Form Type for Rites Hindi Assistant Post Posts is Offline, Online. Q. How many vacancies are available in RITES Hindi Assistant Post Posts ? A. There are about 0 Vacancies in RITES Hindi Assistant Post Posts. A. Full Form of Rites is RITES .